The National Collegiate Athletic Association (NCAA) Men's Division I Basketball Tournament is held over a 3 week period mainly in March (thus the familiar name "March Madness"). The NCAA final four basketball tournament features 65 college basketball teams competing at sites across the United States and has become one of the nation's most prominent sporting events. For anything you could possibly want to know about the NCAA Men's Basketball Tournament, click on this link to the Official NCAA web site. Here, you can print a free NCAA final four basketball tournament bracket showing all teams participating and the dates of each basketball game. This is the perfect sporting event to host some theme basketball parties. There are so many dates to choose from, 3 weeks in fact. You ought to be able to find at least one that will fit into everybody's busy schedule. For us, this tournament usually falls when we are on Spring Break. We usually travel to the same resort in Orlando, Florida called Orange Lake Country Club and Resort and are with the same group of friends. 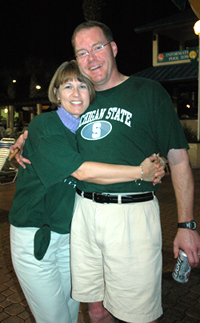 Here we are a couple of years ago when our team, the Michigan State Spartans, was in the tournament. For at least a couple of the games, we hang out at somebody's condo, make some foo-fee drinks and munch on some great appetizers. This basketball tournament is a great excuse to host a basketball theme get together with some friends. Printable games are fun to play at parties. We recently became partners with Python Printable Games and my friend Ashley has some great ones to choose from. You can buy his printable party games individually or you can buy a multi-pack like this one shown here. You get the convenience of buying them online plus you can download them immediately and use them over and over again. This pack includes more than 30 printables that will fit any occasion. A great mix of home party games, including ice-breaker games, history, food and drink, celebrity games, TV, books and movies, NFL and baseball. We like printables for theme parties because they are easy to play with a lot of people and are very inexpensive. This pack, for example, is only $14.95 for 30 theme party games! Just download the package to your computer and you will be ready to print and play. 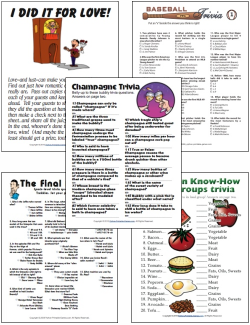 Click here to learn more about Ashley's Printable Party Games Pack. One of our favorite party food appetizers to make for basketball and football parties is a simple Nacho recipe I have been making for years.You can easily make a huge quantity and everybody loves it. For my family of four, one cookie sheet like this is enough. For bigger parties I make several. Preheat oven to 400 degrees. Spray a cookie sheet with Pam. It helps with clean up. Rather than have a huge mound of chips on the bottom with all the ingredients on top, we like to do a couple of layers of the chips, beans and cheese. Start with the tortilla chips, then drop teaspoonfuls of refried beans on top and then sprinkle with cheese. Repeat at least 2 times. We like a lot of cheese and very often will use 2 or 3 different kinds together. Sprinkle on the other ingredients that you want to bake like red peppers and green chilis and then bake for 20 minutes until lightly browned. Serve immediately with topping ingredients. One cookie sheets serves four dinner portions. Click here for more easy recipes including some special cocktails and party punches that would be great at any basketball theme get-together. 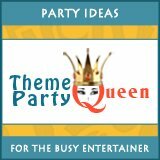 Click here to share your favorite party recipes and ideas and see what other Theme Party Queen visitors have submitted. There are three choices available if you want to mail your own party invitations. I especially love the ease of creating mass amounts of free invitations very easily using Microsoft Powerpoint. When I am in a pinch, I can not afford to waste time hand addressing invitations or waiting for them to come in the mail. I taught myself how to create very basic free invitations in Powerpoint and I use this method at least once a year. 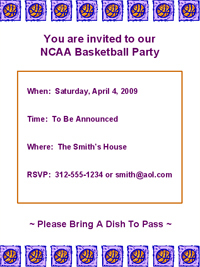 To learn how to create free invitations in Powerpoint, click here to learn how to make basketball theme invitations yourself. You will find detailed instructions with screen shots and a video of me doing it. If you plan on sending your invitations through the mail, the easiest way to get them addressed is to create address labels in Microsoft Word. Go to this page to learn how to Create Address Labels in Microsoft Word.. There's a video that shows exactly how to do it using a free program from Avery. Once you get your invitations in the envelopes with the address labels attached, make sure you have a return address in the upper left corner of every envelope. Each year I get several invitations back in the mail because, for whatever reason, they were undeliverable. Read the history of Super Bowl, learn how to set up a football pool and find ideas for football party recipes, invitations and games. Find everything you need here to host a Bunco Theme Party, including How to Play Bunco, Setting up Your Home, Free Bunco Score Cards and bunco theme food. Want to learn how to host an easy Fondue Party at your home? Find useful tips on party attire, choosing fondue pots and fountains and selecting the perfect fondue recipes and dipping sauces. Our Top 5 ideas for Hen Parties. Some out on the town. Some at home bachelorette theme ideas, including a very funny game. Help the bride-to-be celebrate (or lament) her last night of singlehood. Planning stag parties is almost as fun as the event itself. We have a few ideas that will get you thinking about how to make this night or weekend something the bachelor will never forget.